In my article on the best wireless mics for church, I suggested the Sennheiser EW D1-835S digital wireless microphone. Sennheiser is one of the top brands in microphones. So I wanted to do a more in-depth review of the Sennheiser EW D1-835S. 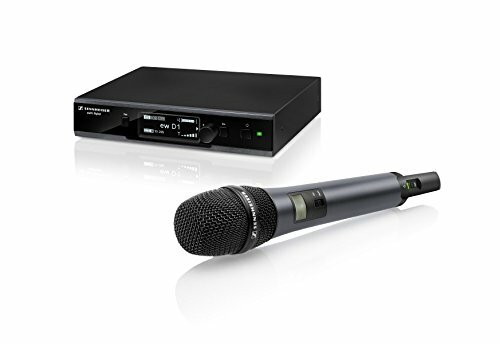 When you need a wireless microphone system that is going to deliver excellent sound every time, you need to check out everything that the Sennheiser EW D1-835S Evolution wireless D1 digital vocal system with handheld microphones and an E835 dynamic cardioid capsule. This wireless mic system will let you focus on what is essential, your performance, and you won’t have to spend time worrying if your gear is going to perform as well as you do. This system will automatically scan and find the best frequency for operation, and if there is any interference detected, the system will automatically move on to another channel. License-Free Operation – You don’t need a license to use this wireless microphone system with 2.4 GHz digital transmission in a public place. Of course, you do need to check to make sure that you are working within any restrictions as imposed by your municipality to avoid disrupting other frequencies. Check with your municipality to learn about any possible regulations or restrictions. Frequency Management – The AFM automatically searches for and changes frequencies. If it is working with one wavelength and there is any interference, it will immediately search for a new and better frequency to use. This means that you are always going to get the absolute best sound quality possible, no matter where you are using this system. Transmission Power – This system will automatically adjust transmission power. This means that you always get consistent, reliable, professional sound quality so you can enjoy a performance without having to worry about losing your transmission all of a sudden. The adaptive, high-power transmission is always checking for signal strength. Range – You don’t have to worry if the receiver is far away from the microphones. This system will give you up to 100 mW, which is going to give you a remarkable working range. You can move around, and still be heard correctly no matter what you are doing. Use Out of the Box – Everything you need to get started is included, and you can use this system right out of the box without having to fiddle with a bunch of settings. You will get the EW D1-835S handheld with cardioid e835 capsule, the EW D1-845S handheld with supercardioid 3845 capsule, the EW D1-ME2 belt back with omnidirectional clip-on, the EW D1-ME3 beltback with cardioid mead mic, and an EW D1-C1 instrument set with ¼” guitar cable. Simple - ew D1 automatically configures itself to deliver great sound. Focus on your performance, not on your gear! Powerful - ew D1 automatically scans and selects the best frequency for operation. If interference is detected, D1 seamlessly moves to a new channel. Reliable - "Wireless link protection" eliminates signal dropouts by continuously adjusting its transmission power and channel selection. Durable - Rugged, all metal construction, backed up by comprehensive 2 year warranty when purchased from an authorized Sennheiser dealer! So, we have talked about some of the best features the Sennheiser EW D1-835S digital wireless microphone system has to offer. However, it can’t all be moonlight and roses, right? Yes, it does have some great features, but there are always going to be things that some users don’t care for. Let’s take a look at the pros and cons to consider before buying this system. Reliability – You need reliability in a wireless microphone system, and this is one that you can count on. The wireless link protection ensures that you will never have to deal with signal dropouts. It is always working to adjust the transmission power and transmission selection, so you don’t have to. Durability – Some of the cheaper wireless systems are made from plastic, and aren’t going to hold up to a lot of travel and use. This system is durable because it is made with entirely metal construction. You get the added protection of a comprehensive two-year warranty when you buy this system from an authorized Sennheiser dealer. Two Versions – This system is available in two versions. If you only need it for vocals, you can get the Vocal version. There is also the Instrument version for musicians who need a great wireless system that they can take with them anywhere. Not Working – Some users have reported that their systems do not work properly. They say whether they use the included batteries or other batteries, they still get less than an hour of battery time. Price – While this is a great-working wireless microphone system, it doesn’t come without a rather hefty price. However, it is true that you do get what you pay for. Priced at around $500, this isn’t the cheapest system on the market, but it is also not the most expensive, and it is a great deal for professional-quality sound. Listen, you can’t go wrong with Sennheiser, especially if your sound system is fixed and not mobile. Whether it is a church, event center, wedding chapel, funeral home, or theater, The Sennheiser EW D1-835S makes a great microphone. If you are mobile, then I would think about Shure microphones. They are a little more rugged.